D.C.,S.D.N.Y. (1-30-1946) ¤ 66 F.Supp. 82. The 1933 Czechoslovakian movie Ecstasy contains music from beginning to end. Some of the tunes were compositions for which American rights were held by Foreign & Domestic Music Corp. After the movie belatedly began to be shown in the United States, the distributor had to contend with the fact that the music supplied on the soundtrack was (apparently) licensed for use in the movie in Europe but not in the United States. The film was distributed (with prints delivered and shipped) October 1941, and in one engagement was shown July-September 1942. Defendant Harbran, Inc., operator of the Gaiety Theater at 1547 Broadway on Manhattan Island, was enjoined. Some of the same issues were litigated in Foreign & Domestic Music Corp. v. Martin Licht et al, USCA 2nd Cir. (5-2-1952), 196 F.2d 627, 93 USPQ 272. It is reported therein that previously the plaintiff was awarded damages of $9800 from Wyngate, and $3800 from the Harbran Company, but that nothing was actually collected. In this later case, defendant Licht was the “medium” of distribution and exhibition. Defendant Astra Pictures exhibited Ecstasy to the Gaiety, among other venues. This later decision extensively discusses the licenses to perform. The decision remarks that it is permissible to own an infringing copy so long as it’s not sold or publicly performed for profit. USCA, 2nd Cir (5-8-1951) ¤ 189 F.2d 469, 89 USPQ 289, certiorari denied 72 S.Ct. 77, 342 U.S. 849.
illustration: timeline chart of copyright status on various versions of Madame Butterfly. EDITOR’S NOTE: On December 8, 1994, the United States Congress passed legislation which led the United States to respect foreign copyrights on foreign works, beginning January 1, 1996. Puccini’s copyright on the Madame Butterfly opera was still valid in his native Italy and thus had long been respected in a substantial number of countries having reciprocal-recognition copyright agreements with Italy. The United States had not been one of them. As noted above, Ricordi had arranged with Puccini’s heirs to extend Ricordi’s rights into and through the second term of the American copyright. Although the new law (which became Title 17 §104A(h)(6)) gave new copyright protection to foreign works “in the public domain in the United States due to … failure of renewal” (or due to other “noncompliance with formalities imposed at any time by United States copyright law”), this didn’t apply to this opera because its American copyright had been renewed. (See the Foreign page of this web site.) Thus, expiration of American protection ended with completion of the second term, in 1960. Had there not been that renewal, any foreign source-country copyright still in effect at the time of American entry into Berne would have to be respected, “for the remainder of the term of copyright that the work would have otherwise been granted in the United States if the work never entered the public domain in the United States.” As it was, the Italian copyright on the opera was still in effect on December 8, 1994, and still recognized in much of the world. Under Italian law, duration of copyright is life of the creator plus seventy years, plus the remainder of the final calendar year. Giacomo Puccini died November 29, 1924, so his Italian copyrights expired December 31, 1994 — a date shortly after passage of the new American law. 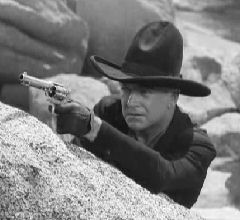 Filmvideo Releasing Corp. had bought foreign-country rights to the “Hopalong Cassidy” movies copyrighted by Paramount from 1935 to 1948 and had access to the original negatives for this purpose. It would be a boon for Filmvideo if it could release the films to American television, but it had not bought those rights. If the films were in every respect in the public domain, anyone could do so, and in that Filmvideo’s use of the negatives would give its copies superlative quality, it would be in an ideal situation to exploit that opportunity. The books were written by Clarence E. Mulford from 1907 to 1935, and there were 26 books in all, each copyrighted, each renewed. (Because the ten copyright extensions enacted from 1962 to 1976 had kept valid all renewed copyrights in works originally registered from 1906 onward, even the 1907 book was still protected.) The decisions affirmed that the books were renewed, the copyrights still enforce, and that the movies could not be shown without authorization of the rights-holders of the novels. (The judge’s decision was reached before it was known that there would be no further extensions of copyrights for works registered 1906-1922, thus the decision doesn’t mention that the expiration of the copyright to the 1907 book at the end of 1982 placed its characters in the public domain.) The representative of the Estate of the late author attempted to have the petitioner’s rights to “foreign exhibition, distribution and exploitation” rescinded, but the Court noted that Filmvideo had merely sought declaratory judgement and had not actually infringed, so Filmvideo was allowed to retain the films to show abroad. 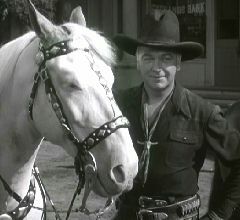 Click for a list of the 26 Hopalong Cassidy books listed in the decision plus the two books not, cross-referenced to the films which adapted them. Obviously, as of this web site being introduced, the 1907 book has entered the public domain. Those interested in using films from this series should realize that many of the screen stories were originals, thus without complications from underlying story rights. 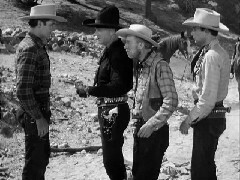 Radio scripts for the Lone Ranger radio program had been copyrighted. Decades after these programs were first aired, the proprietors continued to license broadcasts and sold tapes for home playback. Copyright notice was on these tapes. Nonetheless, Program Radio Corporation created new editions of the tapes and sold them. In its defense, Program Radio Corporation said that it had remixed the tapes. The Court ruled that there had been infringement of the valid copyrights on the scripts which were underlying works of the performed programs. The Court said that in using the pre-existing copyrighted material as the basis of their new work, Program Radio Corporation had merely produced an unauthorized derivative work. “The original version of Kismet was a dramatic play, written by Edward Knoblock in 1911. Knoblock copyrighted the play as an unpublished work in that year and again as a published work in 1912. Knoblock’s copyright expired in 1967, and the dramatic play Kismet entered the public domain. “In 1952, plaintiff Edwin Lester acquired the right to produce a musical stage production of the dramatic play Kismet. Lester hired plaintiffs Luther Davis and Charles Lederer to write the libretto and plaintiffs Robert Wright and George Forrest to write the music and lyrics for the musical adaptation. [EDITOR’S NOTE: The musical themes came from Alexander Borodin, a Russian who lived 1833-1887. This had no bearing on the decision.] In 1953 and 1954, Lederer and Davis copyrighted their dramatico-musical play Kismet, and in 1953, Wright and Forrest assigned to plaintiff Frank Music Corporation the right to copyright all portions of the musical score written for Kismet… . “In 1954, Lederer, Wright, and Forrest entered into a license agreement with Loew’s Inc., a predecessor of Metro-Goldwyn-Mayer, Inc., granting to it the right to produce a musical motion picture based on plaintiffs’ play. 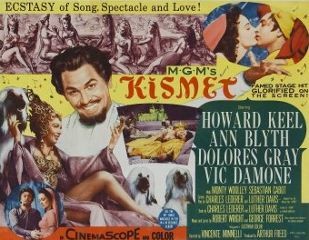 MGM released its motion picture version of Kismet” in 1955. Both courts decided against MGM because the ASCAP license said that “visual representations [were not to] accompan[y] the songs. The license does not refer to ‘copyrightable’ visual representations.” MGM was made to pay a $22,000 award, covering the assumed percentage of profits due plaintiffs. Until “July 16, 1976, when the hotel substituted new music in Act IV”, the act had 1100 performances. Net profit for the revue “during the relevant time period was” $2,489,646. The other nine acts were non-infringing, and within Act IV there were other contributions to the success of the revue, so apportionment was applied. In a trial over a videocassette company having sold unauthorized copies of NBC’s 1960 broadcast of Peter Pan, the decision reports that NBC had looked into licensing the program to RCA’s videodisc enterprise. However, when NBC had made the arrangements for the 1960 broadcast, which is largely a performance of a theatrical musical version of the Sir James Barrie’s children’s story, it had licensed the underlying works for a limited time and limited conditions. (The Broadway production was a hit, and it was a coup for the network to engage that production’s star, Mary Martin.) “Peter Pan could not be licensed to RCA because NBC’s contractual right to license the show had expired. Another reason for the failure was that NBC never had the contractual right to sell tangible copies of Peter Pan. NBC and the Hospital for Sick Children [to whom Barrie bequeathed his rights] conducted preliminary negotiations on the subject but no licensing agreement was ever reached.” NBC had been able to—and did—license the show to broadcasters in five foreign countries from 1963 to 1968, but that had fallen within the time limits and had not been sales of tangible copies. A lower court had determined that there were valid copyrights on the radio programs from 1948 onward. “The District Judge [1986 case] then found that Silverman had had access to the scripts and had listened to the broadcasts, that the first script for his musical indisputably contained substantial portions of dialogue from at least one of the post-1948 radio scripts, and that Silverman was therefore liable for copyright infringement.” The post-1948 radio script from which Silverman copied “significant dialogue” was “not contained in the pre-1948 scripts”. “The fundamental copyright principle applicable to this case is that a copyright affords protection only for original works of authorship and, consequently, copyrights in derivative works secure protection only for the incremental additions of originality contributed by the authors of the derivative works. Thus, the CBS copyrights in the post-1948 radio scripts [and] programs, and whatever rights it may have in the television scripts and programs (assuming for the moment that the programs have not been published without copyright notice) provide protection only for the increments of expression beyond what is contained in the pre-1948 radio scripts, which are in the public domain… . “For Silverman, the basic copyright principle means that he is entitled to use the public domain material from the pre-1948 scripts and may do so up to the point… protected by valid CBS copyrights. Richard Feiner and Co. vs Passport Productions, Inc. and Diamond Entertainment Corp.
Passport assembled a compilation which they copyrighted as “Legends of Comedy.” It excerpted three coming-attractions trailers, one of which bore copyright notice. As the coming-attractions trailers were for earlier compilations, the footage selected had originally come from twelve Laurel & Hardy silent comedies. All were still under copyright. (The trailers advertised the compilation films The Golden Age of Comedy (1958), Laurel & Hardy’s Laughing 20’s (1965) and The Further Perils of Laurel & Hardy (1968), the latter being the one bearing notice.) “The defendants have not disputed Feiner’s assertion that, within the film industry, movie trailers are not sold outright for general consumption, it being industry practice to license trailers for exhibition only, the trailers themselves remaining at all times the property of the underlying proprietor.” Passport was permanently enjoined from using the works, and ordered to pay damages of $30,000 and attorney’s fees of $15,853.09. EDITOR’S NOTE: Where the decision states that “The defendants have not disputed Feiner’s assertion that [it is] industry practice to license trailers for exhibition only,” this does not prove that the Court had determined that trailers distributed in this way don’t meet the criterion of “publication.” As verdicts in similar cases illustrate, a work can be deemed to have been “published” in “instances where prints went to regional offices as part of distribution, thus subject[ing] the copyright owner to loss of control.” (Quotation by M. Nimmer cited approvingly within the decision of Paramount Pictures Corp. v. Leslie Rubinowitz, et al (1981).) Section 62 of the 1909 Act and section 26 of the 1947 Act set the publication date as “the earliest date when copies of the first authorized edition were placed on sale, sold, or publicly distributed by the proprietor” (emphases made by web editor). The movie industry practice (then as now) is for the studios to supply trailers to National Screen Service, which serves as an industry “clearing house” for providing advertising material to theaters. That Passport and Diamond did not dispute Feiner does not prove that they would have won the case had they raised this defense, but rather that Passport and Diamond may have realized they would have lost for other reasons connected with their roundabout means of securing footage from the twelve copyrighted silent comedies without authorization. Metro-Goldwyn-Mayer Distributing Corporation vs Bijou Theatre Co. (launch this) had a studio suing a theater which believed that the copyrights it was violating were invalid because the underlying works on which the films were based did not fit an overly-literal interpretation of the copyright statute. Cyril Russell etc., et al vs Daniel A. Price (launch this) decided that the valid copyright in the play Pygmalion controlled use of the (then) public-domain movie version of the play.